This is one of the mythic climbs in the Alps and a very hard one. It is also one of the most beautiful ones. The climb starts above Thusis in Val Schons on the way to Splügenpass/Passo dello Spluga/Pass dal Spleia (2115m) and Passo del San Bernardino/St. 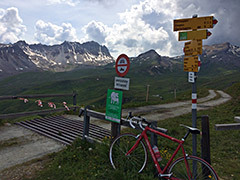 Bernhardinpass/Pass dal S. Bernardin (2067m). In Zillis/Ziran (933m) you go down the village to cross the river and go first to Donat and then you take left (you can also go right but it is a bit longer climb). Asphalt runs out completely at 2325m some 100m before the end and the asphalt fails for some similar stretch just before that too, but that is not really a reason to stay before reaching the parking place. A surprising detail at the parking place is that they have a self-service bar with soda, beer and water and a box to place your coins in (so make sure to bring some coins if you are there on a hot day). Be careful on the descent! I called the concrete strips “anti-cheating strips” as they make sure you do not zig-zag your way up here ;-), but in the bends it is all paved. It is probably a good idea taking another road down and it should be nice around Mathon/Maton (1527m) from where you could descend a similar road to the one down from Wergenstein or you could take the all asphalted longer road down. If going up the main valley you could also take the nice little road above Donat to Clugin/Clugen (not really faster, but nicer). There is also another high point paved above 2000m in the area at Limartsch/Lünartsch (Mursenas) (2033m) (at least it looks like concrete strips to that height even if I did not get time to go there myself). You have to zoom in on the map a little as I combined this climb map with the Splügenpass.